Jack is a bad loose player. He’s been limping a ton preflop and playing pretty badly postflop. Our isolation here is 100% standard, both in terms of our hand and size. The big blind is a weak tight (WT) player. He ran like God when he first sat down running his $500 up to $2k. Since that spurt of hands he’s been playing very nitty both preflop and postflop. 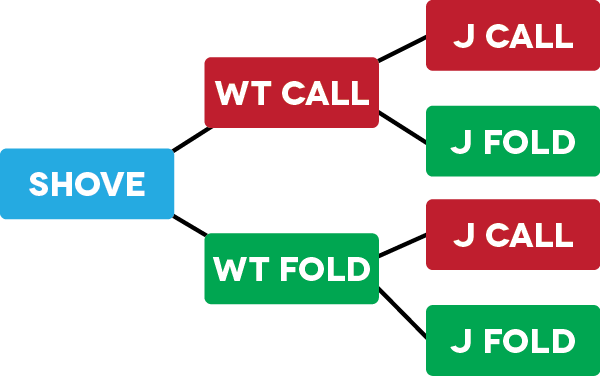 His preflop call is a little unusual for him, but it hints at a pretty narrow range of hands. Hero catches a nice flop for his hand with overs and a two-way straight draw. Hero will pick up the pot a decent amount on the flop and when he doesn’t he has a lot of equity with two cards to come and position. However, Hero faces a check/raise in this situation and a cold call which is unexpected. Luckily for us the WT player sizes his check/raise poorly and we pick up the extra player along the way. This gives us an even better price to call and an extra source of implied odds. I’m not loving the fact that our improvement cards aren’t the greatest in the world (the Eight fills up the 4-straight on board)…but I’m not folding either. I’d assume the WT player has a big hand (by his standards), likely two pair or a set, and just has no idea how to size correctly postflop. Also remember that WT players tend to think of bet sizes in absolute dollars, so if $175 seems like a lot of money to him in real-life he may think his check/raise is large (even though it’s small relative to the pot). Again the WT player makes an horribly sized bet. Once Jack calls we are getting almost 5:1 on our money and can easily call with just a draw. Really not much to talk about here as this is strictly a pot odds decision and luckily for Hero, he got ’em. WT checks, Jack checks, Hero ??? First we need to assign some ranges. I personally think that the WT player has one of two hands: T9s or 97s. I think if he had TT, 99, or 77 he would have shoved the river. A WT player isn’t going to check the river to try and induce after he’s taken this line. Which means his check is likely a two pair that hates life when the bottom card pairs the board. Now because he’s a tight player I think he will call T9, being unable to fold getting ~3:1 on a call. But I think he will fold 97s thinking his two pair got negated by one of us. A WT player isn’t going to be a good hand reader so I don’t worry too much about what I rep against him. I just care that he will fold enough since his decisions are based more around his own hole cards and comfortability. 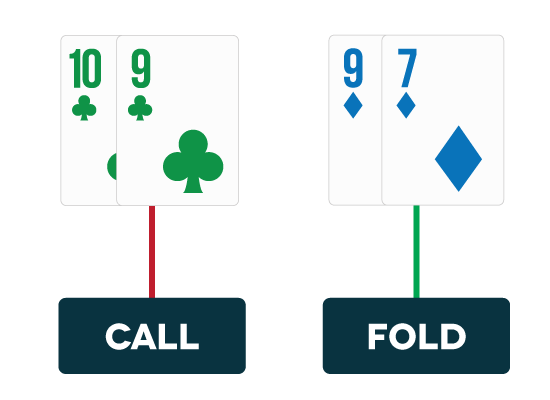 So I assume* if I shove he calls 50% of the time and folds 50% of the time. Easy enough. The sum of all branches equals -$205.15 meaning that Hero’s shove is very -EV. Of course, it’s -EV given the assumptions I made both in terms of ranges and frequencies. If you change any assumption, even just slightly, the entire EV will change. The better you get with hand reading and combo analysis the easier this kind of thing will be…so make sure you keep working on it. 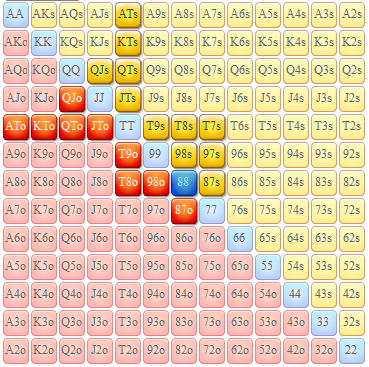 In real-time you won’t be able to run this kind of poker math in your head. But enough practice and exploration will allow you to eyeball these things easier at the tables. Given the assumptions I made Hero should be checking the river behind and cutting his losses. There is something to be said for playing a draw aggressively when it misses…but this doesn’t look like the right spot for it. Even if you didn’t like the hand, or you disagree with the range analysis, the big concept to take away from this is how to solve the EV in complicated spots. Whenever you get confused start by drawing that tree diagram. 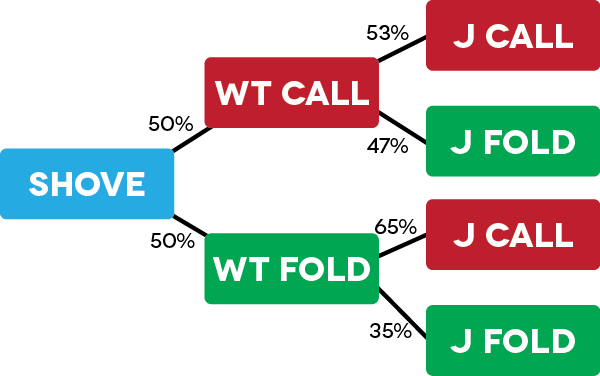 Think about the logical branches and just multiply each branch by the expected win/loss dollar amount. This is a great way to study hands away from the table and get reps with combos, ranges, math, and eyeballing the EV of new spots! * You may make different assumptions about his range which of course will shift the folding frequency. If you disagree just plug in your numbers and proof the math. If you come up with any cool findings let me know!